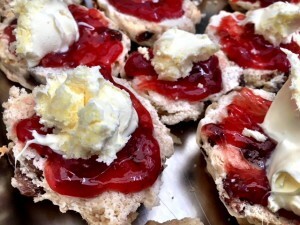 So here we have the age-old question for the West Country; is it jam then cream or cream then jam? Also, importantly; butter or no butter? 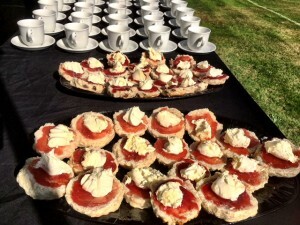 Well Hog Roast Launceston ventured into this dilemma when asked to cater recently to serve cream teas in the mid-afternoon for 50 people and a hog roast for 120 people in the early evening. Clearly, this event would need to be very carefully planned and this is one of the areas that Hog Roast Launceston specifically concentrate upon to ensure that all expectations are at least met, and often surpassed. Our catering manager Charlie, liaised with the client to identify the specific requirements, serving times and loading/setting up arrangements. Upon discussing the menus for the evening meal, the client wanted our traditional hog in a roll but with veggie skewers, coleslaw, Thai salad and new potatoes. We were also asked to provide desserts and lemon tart and summer pudding were chosen for these options. There are plenty of good caterers out there but we believe that what makes Hog Roast Launceston great, is this attention to detail, high quality food, exceptional service and adaptable approach that ensures that every client has a tailored service that cannot be surpassed. Here at Hog Roast Launceston, we clearly understand that any event is a special and we always ensure that our service is professional, friendly and high quality and with precise attention to detail. We have a wide selection of menus available for all events ranging from an informal Hog in a Roll selection through to more formal sit-down options with evening buffet too and we know that the choice of menu for any type of event is crucial to its success. Event planning is a fundamental part of our seamless service and with a serving time of 3pm for the cream teas and 6pm for the evening meal, we arrived at the venue in good time and liaised with the organisers to discuss the arrangements and began to set up. Guests within the vicinity became immediately interested in what we were doing and what we had to offer with many of the them fascinated by the sight of the hog roasting away and the fabulous, aromatic flavours that were emanating from our roast and from the wide selection of food that we would be serving.